You’ve signed up for your Shopify trial, set up social media accounts, chosen a designer, and now you’re just waiting for your store to go live so you can start selling. It’s an exciting time, but it should also be a busy one for you. Here are ten tasks you can handle before launching your Shopify store , to ensure that it has the best chance of success. Before launching your Shopify store it’s important to decide how you’re going to track site traffic and conversions. Your Shopify store will already have some analytics reporting built in, but it’s advantageous to add another tool. Results can sometimes vary slightly, so it’s always good to take an average result, and different tools will enable you to track in different ways. One of the most popular and versatile tools is Google Analytics. It requires inserting a brief bit of code into your site to setup, then you just configure e-commerce tracking and establish your sales goals. If you have a Shopify Plus store you can also use Google Tag Manager to keep track of events and re targeting. Tag Manager gives you the freedom to add, edit, or remove measurement tags without any hard coding. Here are Shopify’s easy follow tutorials on setting up analytics and Tag Manager. The Facebook Pixel is another free tracking tool that can give valuable insights into your customer’s behaviour. It allows you to create different audiences based on specific actions of your site’s visitors. You can create audiences for all visitors who viewed a certain product, people who’ve visited a few times in the last month or visitors who abandoned their cart. Then you can target them with ads in Facebook and Instagram. Here’s how to install Facebook Pixel before launching your Shopify store. The convenience of being able to see how your site is performing across a variety of metrics – landing page conversions, social media, advertising, etc. – is a game changer for business owners who want to be reactive to customer needs. Before you drive traffic to your store, you’ll want to be sure people can actually complete a purchase. Place a test order on your site with a live payment gateway to make sure everything works. You can refund your order immediately afterwards. Email is a powerful tool for e-commerce. Shopify stores have automated emails which you should edit and customise before launching. You should be write these emails in your brand voice, and use a branded email template. If you are working with a designer, speak to them about creating an email template to match your store. It’s important to check that your tax settings and shipping rates are appropriate for the products you’re selling. Otherwise, you could unknowingly eat into your profits by under charging. Double check your tax and shipping settings before launching your Shopify store. Depending on where your business and customers are located, you may need to add sales tax. If you sell from eBay, Wish or Amazon you should connect these in your seller dashboard before launching your Shopify store. There are many more marketplaces which link with Shopify, and the list is always growing, so it’s best to check which online marketplaces work with Shopify. Shipping can make or break an e-commerce business. Free shipping is a proven way to increase conversion, and before launching your Shopify store you should definitely shop around to make sure you’re getting the best value shipping. But if you’re not able to offer free shipping, be clear about what you are charging. Do not make customers search for shipping costs and do not make them wait until the last moment. Unexpected shipping costs are the most common reason for cart abandonment. 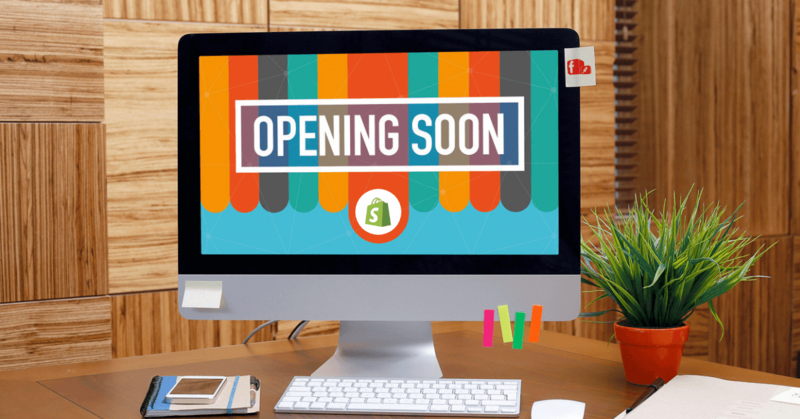 So, how are you going to tell the world about your brand new online store? Before launching your Shopify store, you need to have a robust plan for how to attract the attention of as many people as possible upfront. You can do this by offering a site-wide discount straight out of the gate. Or hold a contest of some sort. You’ll want to post frequently on your social media accounts prior to the store’s launch as well as do some community building. It won’t do you any good to share frequent messages if you don’t have any followers. Once the big day arrives, make sure your launch plan is consistent and takes into account every place you have a presence online. Take the diversified approach and you should be good. If a customer is on your about page, they are 100% interested in your company. They may be looking for evidence of your legitimacy as a company, or they may just be so impressed with your brand that they are curious to know more. Either way, this is your chance to tell your brand story, really impress your values and get your unique points across. This is your chance to really connect with the customer and build trust. Be honest and compelling. Show your enthusiasm. Give customers the information they want, in your unique brand voice. Your product page is the place to pitch your product and answer customer questions. You have your interested audience captive and this is your chance to sell to them. Before launching your Shopify store, make sure that your descriptions are the best they can be. Don’t just give them the dry facts on the item, write product descriptions that excite and engage. Speak in your brand voice and don’t forget to illustrate your words with plenty of high resolution product photographs and video. Hosted e-commerce solutions like Shopify may take away the stress of technical maintenance, but the big issue of getting traffic to the site remains. Paid ads with Google will help you to pull people searching for products you sell, into your store. Facebook ads can also be targeted, and are great for both audience building and impulse purchases. Knowing your customer persona will help you to create ads that really appeal to your customers and target them well.